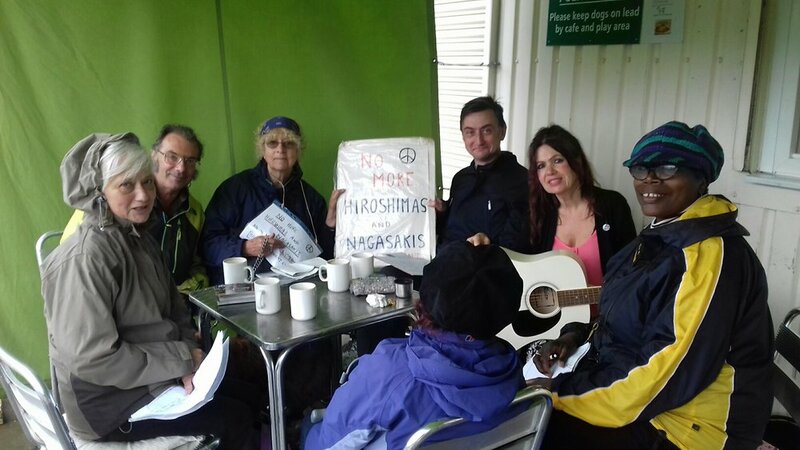 On a day when tensions between the US and North Korea were increasing, and nuclear arsenals were being flaunted by Donald Trump and Kim Yong-un, a small group of people from Bromley and Beckenham CND met with members of Lewisham and Greenwich CND and one person from the Sydenham and Forest Hill CND area, to mark Nagasaki Day. They met in pouring rain in Chinbrook Meadows , Grove Park in a café ‘Snack in the Park’ near the Archbishop Tutu Peace Garden [ opened by him in 2007 ] to read poems and make statements opposing nuclear weapons. After this they walked with peace banners to the River Quaggy nearby and threw white chrysanthemums into the flooding waters in memory of the 340,000 people who died as a result of the dropping of atomic bombs on Hiroshima and Nagasaki by the US in 1945 at the end of the Second World War. Japan had already wanted to surrender, but the US were determined to use the bomb to show its strength and dominate the post-war world. Today over 17,000 nuclear weapons still threaten the survival of the world and Britain has 225 nuclear weapons and has voted to renew the Trident Missile system at an estimated cost of £205 billion. The present UN Nuclear Test Ban Treaty has been ratified by 50 countries, but the US, France and Britain have stated that they don’t intend to sign it. The use or threat of use of nuclear weapons is illegal under international law, and yet today we are perilously close to this being breached. This is why CND [ the Campaign for Nuclear Disarmament ] and other peace organisations are continually working for international and unilateral disarmament.